NOTE: You can read Part 2 here and Part 3 here. I have been spending a month (has a month gone by already?) with Blue Rose, trying it out. I figured that before I review it I had better run it through it's paces the best I can. This review might be kinda long, but then again the book is a rather large one. 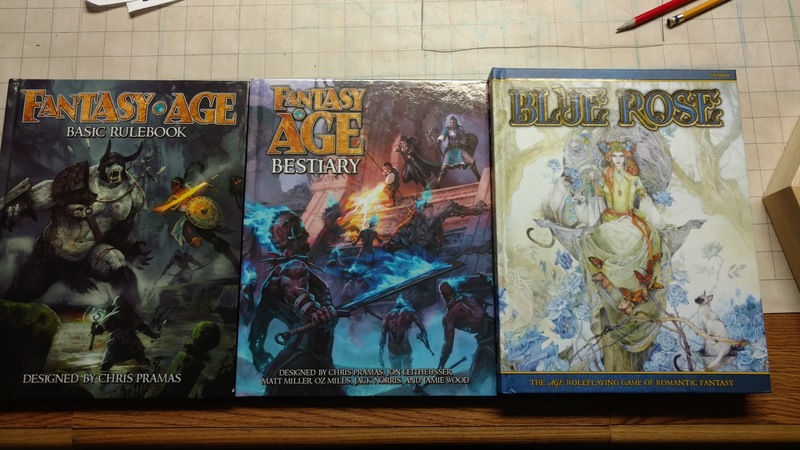 Blue is the newest AGE (more on that) game title from Green Ronin. It is an update to their older True20 version of Blue Rose. This game expands the World of Aldea and the timeline a bit as well as give us some more option for play. I am reviewing both the hardcover edition and pdf of this game. Both of which were purchased by me and not sent to me for the purposes of review. I will post my thoughts both on the reading and playing of this game. The Blue Rose book is a 384 page, full color, hardback book. The hardcover is sturdy as hell and might just be one of the most gorgeous books I have seen in a very, very long time. The color jumps out at you. Blue Rose is not a grim-dark world and this book is not either. The PDF is huge and fully bookmarked and hyperlinked. I love PDFs, and for ease, I am using mine for review now, but there is no comparing it to the physical book. The hardcover retails for $59.95 and the pdf for $24.95. You can get the PDF for $5.00 at participating game stores when you buy the hardcover. Blue Rose 2nd edition uses the same AGE or Adventure Game Engine, game engine found in DragonAge and Fantasy Age. All three games share "System wide" compatibility, but maybe not "thematic" compatibility. Though if you desire more monsters in your Blue Rose or Dragon Age games then the Fantasy Age Bestiary is the absolute perfect choice. I will detail more about the AGE system in a bit. The Player's Section covers the first four chapters of basic rules, character creation, and magic. The World of Aldea covers the history of the world, the Kingdom of Aldis, and the surrounding lands. This takes up the next four chapters. The Narrator's Section covers the last five chapters. 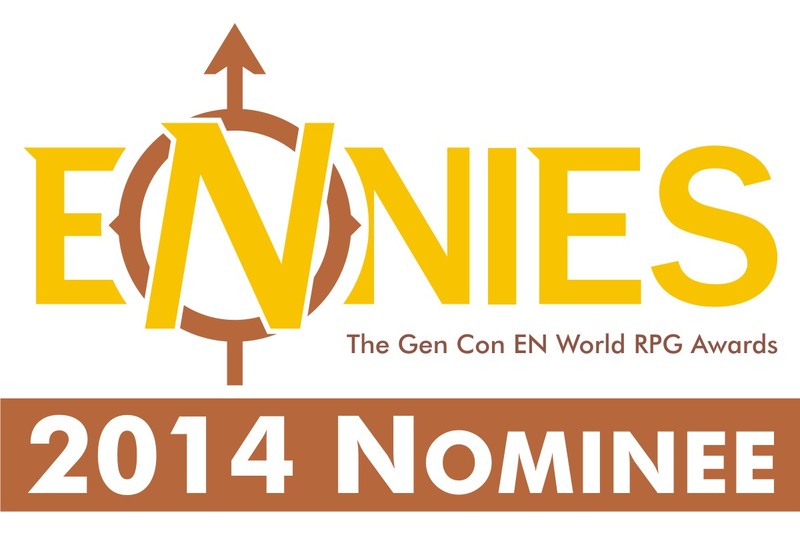 This covers how to run a game, what makes "Romantic Fantasy" different, as well as rewards and adversaries. There is also a sample adventure in back to tide you over till you pick up a copy of The Six of Swords. Now off the bat, an easy criticism would be, why not separate these out into three less expensive books. Charge $24.95 each and make more money in the long run? Sure that would work and that is what Green Ronin did with their True20 versions. Personally, I like having everything in one tome. Though I do see a need for a slimmer, maybe soft cover, version of just the player's section for players to buy. But Green Ronin has been doing this a long time if their economics support this then I am not going to be an armchair accountant. The first five pages start with an introduction to RPGs. Most times I skip this, but this time I stuck with it since one of the expressed purposes of this game is to bring in new players. The "What is Roleplaying" section covers what is expected. This is followed by a section on "What is Romantic Fantasy?" For this bit, and for this review, I went back and read (or re-read) every book I could in the Romantic Fantasy cannon. This includes all the Valdemar books by Mercedes Lackey (minus the last series) and nearly every book on John Snead's own "Must Read" list. 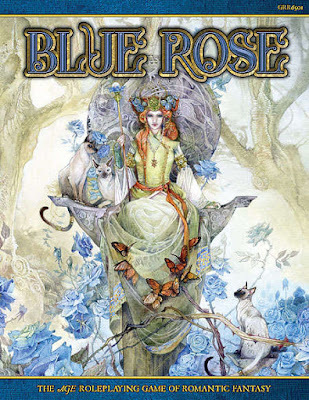 I'll talk about those relationships in detail as they come up, but suffice to say (for now) that Blue Rose does do a good job of Romantic Fantasy. The next paragraphs deal with how you go about creating a character in a game world. Not mechanics (yet) but an extension of your senses into this world. This section I noticed also features in other Green Ronin AGE books. It asks the questions "What do you do?" and "Who are you?" The focus of this game then is character dynamics. 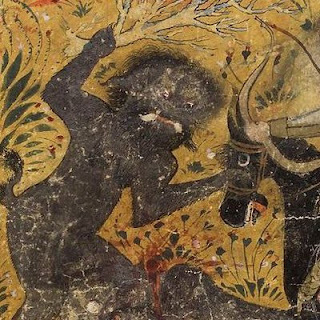 It is not "The party of adventurers set out to destroy the dragon." it is "Brynn, Heylg, Bethan and their friends sought out the threat to their beloved kingdom and stopped it before more lives were lost." There is nothing wrong with either situation, it is just one is better suited to Blue Rose. Becuase of this there is more focus on group dynamic. Maybe Bethan, normally a strong independent warrior who fights for just causes, is also deathly afraid of fire from an incident in her childhood. Now fighting this dragon is not just a straightforward matter of defeating a beast; it is now a metaphor for overcoming fear even when you are normally strong and brave. It could be that Brynn's best contribution to this battle is not her magic to attack the dragon or her healing, but her ability to empathize with Bethan and bring out the warrior she is from the scared girl she was. If this dynamic is not that interesting to you, that's fine, the Blue Rose/AGE game will still let you kill the dragon, but something essential is missed. The next section deals with the AGE system itself. The system is actually quite a simple one. 3d6 + Ability +/- mods vs. Test Difficulty. What makes this system special though are the Stunts. Whenever you score "doubles" on a roll (on two of the dice, more later) you generate stunt points. Stunt points can be used for any number of special features. These are not limited to combat. You can score Stunt Points in any situation where you roll dice. So yes you can even generate Stunt Points (SP) while engaging in social interactions. I have long let Bards in my D&D/d20 games score "critical hits" with puns, but in Blue Rose you can now do the same (mechanically speaking) with all sorts of social interactions like flirting! Finally, we end with a bit on the campaign world, but I will detail that, as does the book, later on. This section introduces us to both the Blue Rose game and the AGE system. Chapter 1 discusses the AGE system and goes right into Combat and Stunts. I thought this was an odd choice in a game focused on characters. At first that is. After reading through it a few times now I see it makes good sense. 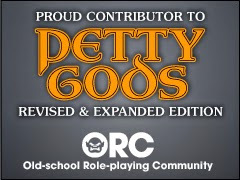 I am not sure if the AGE system will ever "fall into the background" the same way d20 or Unisystem do for me, but it could get really, really close. The system itself is very easy to grasp. In AGE you really only need three six-sided dice. Two of which should be the same color. The off one is called the Drama Die. We will get to all those in a bit. The rolls of 3d6 + Ability +/- mods vs. Test Difficulty are simple enough. Test Difficulties start at 7 (Routine) and increase by 2 for each level. So 9 is Easy. The feel is the same as d20's Target Numbers or even Unisystem's Success Levels. 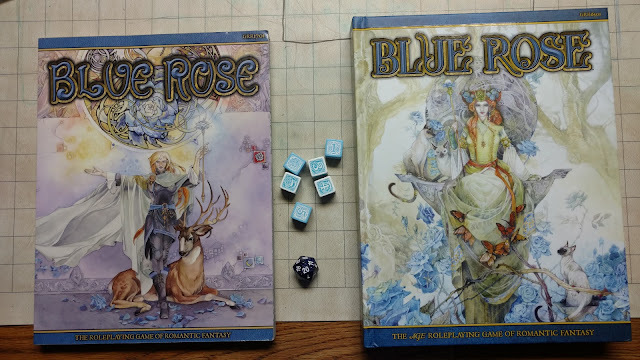 The spread is closer to that of the d20 world so converting between the True20 Blue Rose and the AGE Blue Rose should theoretically be an easy one (in reality there is more to it, but not much more). Like most systems an "opposed" test will be one set of rolls vs another set of rolls. 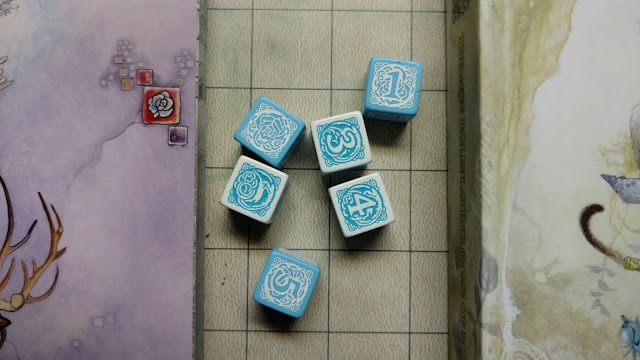 Aside: Since the rolls here are 3d6 as opposed to 1d20 (d20/D&D) or even 1d10 (Unisystem) you are going to get far more average rolls and fewer extremes. This result is as subtle as it is ubiquitous. This means that most rolls (67.6%) are going to fall in that 8-13 range. 18's will only happen 1 time in 216, as opposed to a 20 happening 1 time in 20. This means that most actions will feel "normal". It's later when we add the Stunt Points and Conviction that the real acts of Derring-do happen. This puts the "criticals" more in the hands of the players and less to chance. They happen less often, but more where the player wants or needs them. This is something I have done in my own Unisystem games for years. Instead of a 1d10 I use a 2d6-1 system known as "The Chicago Way" among Unisystem players. The effects are quite nice. The 3d6 gives AGE Blue Rose a solid edge over True20 Blue Rose. In addition to these tests there are modifiers, which typically include a Specialization in a skill or other training. There are are also Conviction points. These are gained throughout your adventuring career and can be used to influence certain actions. Conviction is used a bit like a Drama Point or a Hero Point. On every turn the character can take a Major and a Minor action. Each round is only 15 seconds long (4 per minute) so each action is short. There is a list of what major actions are (Attack, Defend, Heal) and minor (move, aim, activate). In truth, the lists are pretty simple and easy to grasp. There are also variable actions that will change depending on the situation. Next up are Stunts, the life, and soul of the AGE system really. Chapter 2 covers Character Creation. This covers all the steps from concept to filling out your sheet. Blue Rose is a very character-focused game, so character creation should be something done all together for the first session. I even suggest talking about what sort of group you want to have. There is no reason why it can't be "You all meet in an Inn", but it should go deeper than that really. How do these characters interact with each other, what are their goals, their drives? In some ways the best Blue Rose group of heroes is something like what we get in the Dragonlance tales. A group full of characters internal desires and drives but a community, if not a family, of others helping them. Blue Rose has 9 Abilities. They have familiar sounding names and are even rolled up the same way. In fact in Blue Rose, your abilities are rolled on a 3d6 IN ORDER. Yes, it is more Old School than many Old School games out today. The spread of ability modifiers is also similar. Every ability has more than one focus. These Focuses allow the character to be better at one particular area. Systematically Abilities and Foci serve like abilities and skills. Up next is Class. Like other AGE games and True20 there are only 3. Adept, Expert, and Warrior. As you level up you can gain different abilities from your class. These are typically increases in abilities (which ones depend on class). Classes are presented from 1st to 20th level. You then need to figure out (or randomly roll) your Calling, Destiny, and Fate. Finally it would not be Blue Rose if there was not a bit on Relationships. Everyone in the cast is tied to another by one degree or another. These relations have role-playing and in-game mechanical features. If you are looking for XP per level you will not find it in Blue Rose. This game uses the same philosophy as it's older True20 sibling; you increase in level after a few adventures. It leaves it in the hands of the Narrator as to when to level up. If you really want an XP chart for Experience to next level then there is one in Fantasy Age. Chapter 3 details Focuses, Talents and Specializations. Every Ability has multiple focuses. The Fighting Ability has a focus on Axes and another Polearms for example. You can gain a new focus for everytime you go up a level. Talents are something else. These are only granted under special circumstances. They might be restricted by class and many have prereqs. These include abilities like Animal Training, Dual Weapon Fighting, or Psychic. Specializations can almost be though of as "Sub Classes", these include Assassin, Bard and the like. Chapter 4 covers Arcana, the magical arts. While anyone in the world of Blue Rose can have arcane ability, only Adepts can master them. Arcana are divided into six Disciplines; Animism, Healing, Meditative, Psychic, Shaping (for making Avatar like Benders!) and Visionary. There is also Sorcery, the dark side of magic which leads to corruption. Each ability is given with the Talent (Discipline) it falls under, sometimes it is more than one, time is takes (Major or Minor), Target Number and Test needed. What sort resistance covers this ability and fatigue TN? Some abilities have sub-abilities too. Many of Shaping abilities are like this. The last part of the chapter covers Sorcery. This is great for all sorts of adventure ideas. Hell, 90% of my ideas deal with some form of sorcery and it's threat to Aldea. That's a lot so far. Next time let's look into the world. Did something get chopped off at the end of your section on chapter two? It just says "It leaves it"
Can you speak more on Calling, Destiny, Fate and relationships later? These mechanics are, I think, what really sets BR apart from most other fantasy RPGs, and I'm curious to hear how they work at the table. I'll make sure to talk more about these.